Decentralized healthcare will challenge the use of Electronic Health Records (EHR). ICWUSA mounts may help caregivers adopt EHR systems. CLINIC EXAM ROOM. ICW’s low profile mounts provide immediate access to EHRs and require a minimum amount of space. Hospital acquisitions of outpatient specialty centers and private practices are increasing. These mergers and acquisitions present Electronic Health Record (EHR) adoption challenges. Mergers and acquisitions allow hospitals to extend their brand and market share, thereby increasing revenue sources while creating a broader referral base. Standardizing electronic health records (EHR) systems across newly acquired facilities is complex; improving system-wide compliance is crucial. EHR can enhance healthcare for patients,and may increase hospitals’ profitability by improving efficiency in clinical operations and patient care. The most important feature of EHR adoption is ease of use at the point of care. Computer mounting solutions that support caregiver workflow and simplify use of technology may improve adoption of an EHR system. Physicians and nurses want the ability to simultaneously chart and maintain eye contact with patients. Technology that promotes caregiver-patient communication improves the patient experience and increases staff satisfaction. Computers mounted at the point of care promote legible, complete documentation and accurate, streamlined coding and billing, helping to meet business goals. 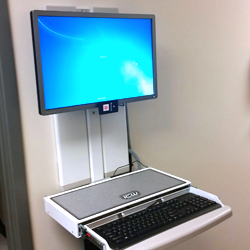 ICW’s articulating computer mounts provide caregivers with immediate access to EHRs, while simultaneously allowing them to maintain eye contact with patients. Simplifying access to EHRs while increasing staff satisfaction with the quality of care they provide may enhance caregiver adoption of EHRs.